Though there still is no continuous national program to properly dispose of the 10 to 40 percent of prescription and over-the-counter medications that go unused, a few local governments in California and Washington are leading the charge to find sustainable funding sources. Unprescribed: Drugs in the Water Cycle infographic. Click image to enlarge. During the summer of 2012, Alameda County, California, signed a first-in-the-nation law requiring drug manufacturers to pay for a program to collect and dispose of unused pills. The county, home to 1.5 million people on the east side of San Francisco Bay, was subsequently sued by the drug industry, which claimed a constitutional violation due to a burden on interstate commerce. Two weeks ago, a U.S. district judge in San Francisco upheld Alameda’s program. Coupled with a similar law passed this June in King County, Washington, local governments are beginning to succeed where federal and state governments have failed in forcing drug manufacturers to foot the bill for disposal programs. These take-back programs, most of which operate without industry funding, are designed to address a number of public and environmental health concerns: accidental poisoning from domestic stockpiles of old medicines and the accumulation of trace amounts of chemicals in water bodies from people tossing or flushing unwanted pills. The latter problem is the object of intense scrutiny from academic and federal scientists, who want to understand how the proliferation of pharmaceuticals affects both drinking water supplies and the aquatic species that are now living in an increasingly medicated world. Despite the August 28 ruling in favor of Alameda County from U.S. District Judge Richard Seeborg, drug manufacturers remain opposed to paying for these programs. The Secure and Responsible Drug Disposal Act of 2010 allows consumers more options for discarding controlled substances, such as narcotics and antidepressants. Currently those medications can be accepted only by law enforcement officials. Last December, the U.S. Drug Enforcement Agency submitted draft rules for implementing the new law. The proposed regulations allow retail pharmacies and manufacturers to collect controlled substances on site, or to administer programs in which consumers mail back unwanted or unused drugs. A final ruling could be out by the end of the year. “Though disappointed in this lower court’s opinion, we maintain our opposition to take-back programs like Alameda County’s, which place the entire responsibility on pharmaceutical manufacturers for the execution, finance, management, and administration of otherwise municipal operations, and shift the costs and burden of such local programs to out-of-county consumers and companies,” said the Pharmaceutical Research and Manufacturers of America (PhRMA) in a statement. PhRMA, a plaintiff in the case, was joined in the lawsuit by the Generic Pharmaceutical Association and the Biotechnology Industry Organization, both industry lobby groups. Meanwhile, King County’s take-back regulation is more comprehensive than Alameda’s. The Seattle-area jurisdiction accepts over-the-counter medications in addition to prescriptions. In testimony during public hearings before King County’s regulation passed, the pharmaceutical industry threatened to sue the county, said Margaret Shield, a policy liaison for King County’s Local Hazardous Waste Management Program. “The county had the political will to pass the regulation,” Shield told Circle of Blue, noting the unanimous vote. Indeed, take-back programs funded by local, state, and federal sources have proved popular. Each U.S. Drug Enforcement Administration take-back day, held twice a year, sets a new collection record. Since October 2010, the DEA has received more than 1,270 metric tons (2.8 million pounds) of prescription drugs from the public in six such events. Put drugs in a plastic bag. Mix with kitty litter, used coffee grounds, or sawdust. 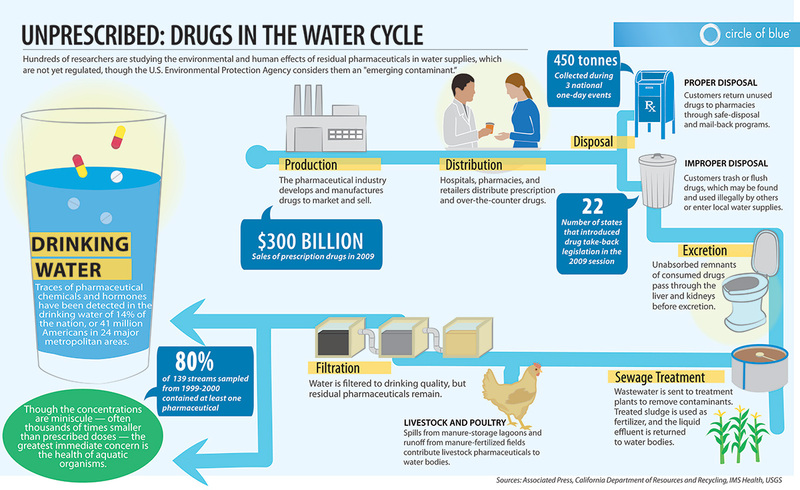 The push for industry-funded drug disposal is part of a broader “product stewardship” movement in which governments, often with limited and unstable financial resources, are shifting the costs of disposal to the producers. At least 33 states have a law covering the disposal of one or more consumer good, according to the Product Stewardship Institute, a leading research and advocacy group. Most laws address electronics, batteries, and paints. Industry-funded disposal programs similar to Alameda’s have been stymied in state legislatures, due in part to lobbying by the pharmaceutical industry. Legislation to establish a national industry-pays drug take-back program was introduced in the House of Representatives in 2011 by New York Democrat Louise Slaughter, but the bill died in committee. Concerns about accidental poisonings and drug abuse are domestic arguments for ridding medicine cabinets of expired and unused medications. The environmental argument centers on water resources. Some chemicals and compounds are not metabolized by the body. Residual compounds from medications are excreted in urine, while compounds found in skin creams can be washed off the body. For these sources, take-back programs would have no effect. In this same vein, the hundreds of FDA-approved chemicals in soaps, lotions, and other personal care products also play a role, as does the livestock industry, which pumps animals full of hormones and disease-blockers. It should be noted, however, that the pharmaceutical industry is working to develop medicines that the body processes more efficiently, so that less contamination of this sort occurs. Lacking an easily accessible venue for safe disposal, some people simply toss unused drugs in the trash or toilet. Improper disposal is assumed to be the smaller contamination source, accounting for a few percentage points to one-fifth of detected chemicals, depending on the study, Christian Daughton, the chief of the environmental chemistry branch of the EPA’s National Exposure Research Laboratory, told Circle of Blue in 2011. Though the flow from each pathway is uncertain, evidence of drugs in waterways is ample and mounting. Even large lakes, where dilution was assumed to cleanse, are susceptible. For instance, research published just last week in the journal Chemosphere found 32 chemicals from pharmaceuticals and personal care products in Lake Michigan within 3.2 kilometers (2 miles) of wastewater treatment plants in Milwaukee, Wisconsin. The most common substances found were caffeine; metformin, an antidiabetic; sulfamethoxazole, an antibiotic; and triclosan, an antibacterial. Researchers elsewhere are looking at how persistent exposure to small doses can turn fish moody and male frogs into females. Others are considering the effect on human biology or microbes, which, after living in pharma-water, might develop resistance to the very substances designed to kill them. All told, take-back programs are a small but symbolic way to cut off one water-contamination path for the $US 320 billion prescription drug industry. Another way is to simply eliminate the source altogether, which is happening with greater frequency for personal care products — following the lead of fellow consumer goods giant Johnson & Johnson, Proctor & Gamble announced recently that it would stop using triclosan in its products by 2014.